The Subaru XV Crosstrek is a CUE mighty mite of a vehicle with a plethora of useful features that make it both handy and fun. The hatchback offers all wheel drive, over eight inches of ground clearance, an EyeSight active safety option that uses cameras and sensors to provide active cruise control, lane-departure warnings, and pre-collision braking. Essentially, what Subaru created a mini Forester. 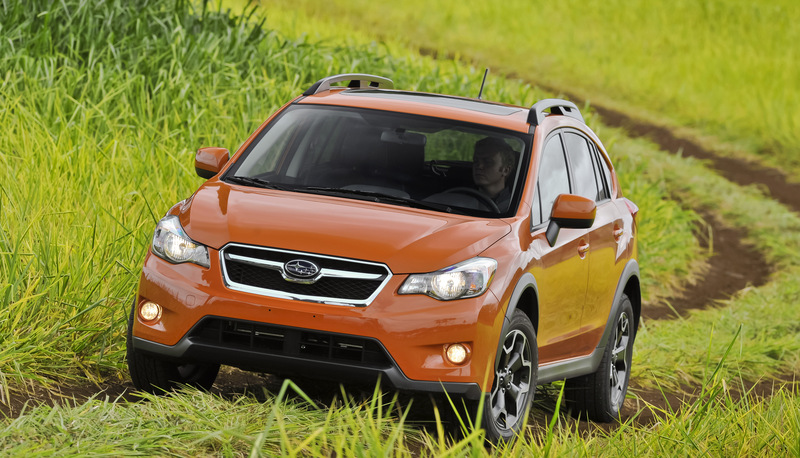 The smaller Crosstrek cost less, starting at $22,000 and gets an estimated 34 highway mpg. This handy CUE opens up access to the desert, beach, and mountains while still retaining its creature comforts. Want to test your endurance, with good driving habits you could make a 400 mile round trip without refueling. The Subaru has the ability to go off-road, handle inclement weather (it could happen) and still park in the smallest space. It is both affordable and athletic. Adding to that appeal are a variety of features for those who enjoy the outdoors with bike and ski racks, roof-mounted cargo carriers, electric outlets and handy dog hauling options. Mom’s view: An interesting offering, the Crosstrek is ideal for the young at heart in terms of cost and utility. The ride is very compliant and stable with a nice heft to the steering. The engine creates 148-horsepower and Subaru uses a continuously variable automatic transmission to maximize the powerplant’s potential. A five speed manual is also offered. Although smooth and economical to operate, the four cylinder engine isn’t designed with high speed driving in mind. Safetywise, Subaru offers its EyeSight safety package with adaptive cruise control, pre-collision braking, lane departure warning and more. Very worthwhile. Overall, a very cute, comfortable and capable CUV for the young at heart. Well priced and cute. Dad’s view: Subaru’s Symmetrical all-wheel drive provides reassuring grip at all times with very little fuel cost. The body makes no apologizes to it big brother, the Forester, even copying the lower body panels that help protect the exterior when traversing unpaved roads. There are three Crosstrek versions; the base, Premium, and Limited. Each model each adds a little more to the mix. Subaru offers two versions of Symmetrical All-Wheel Drive in the XV Crosstrek. With the 5-speed manual transmission, the AWD system uses a viscous-coupling locking center differential to distribute torque. The Crosstrek is very car-like to drive and is quick on its feet thanks to an aggressive accelerator pedal.. The electric steering is responsive, headroom quite good, and the overall impression is one of being in a very comfortable and capable vehicle with excellent visibility. It may not be fast, but using the paddle shifters to keep the engine on boil is entertaining. Young working male’s view: The Starlink infomainment is user friendly and makes the Subaru the equal to others in its class. New this year is the STARLINK Multimedia system that provide an array of music and information sources and a seven inch touch screen display. Sound, phone, and information are all handled with this application. If you live in the mountains or frequent colder climates, I would order the All Weather Package that includes heated seats and outside mirrors, plus a windshield de-icer. Other options worth considering are the safety laden EyeSight program, a moonroof, touch-screen navigation, and keyless entry and start. Since I haul a lot of equipment I would opt for the Crosstrek’s big brother, the Forester. Young working woman’s view: A low entry height is appreciated when wearing a dress and the seats are quite comfortable. The Crosstrek can hold four adults and, when the rear 60/40-split rear seatbacks are folded, the Subaru yields a flat load floor with nearly 52 cubic feet of cargo space. There are some clever storage compartments that can hold a variety of small items, including a cell phone, and the rear hatch opens easily. Entry and exit are a little tight due to the size of the door openings, but once inside there is room to stretch out. The tilt/telescoping steering makes it easy to find a good driving posit ion. Subaru even has door pockets designed to hold drink bottles. The Crosstrek received good crash test scores and wraps you in a cushioned cocoon with a driver’s knee airbag, standard front side pelvis/torso airbags and side curtain airbags that offer front and rear outboard seat coverage. The airbags have sensors to determine front air bag deployment strength as well. Subaru claims that the roof is strong enough to hold at least four times the vehicle’s own weight should that be worth a bar bet. Interestingly, the Crosstrek has a brake assist system that detects how quickly the driver has pressed the pedal, and if pedal velocity exceeds a certain threshold, it applies pressure to increase braking effectiveness. Subaru even offers a system that cuts engine power when the brake and accelerator are pressed simultaneously. The Crosstek is for the young at heart. Family conference: We have recommend Subaru products for several years for many reasons. First, the cost is very reasonable for all wheel drive vehicle. 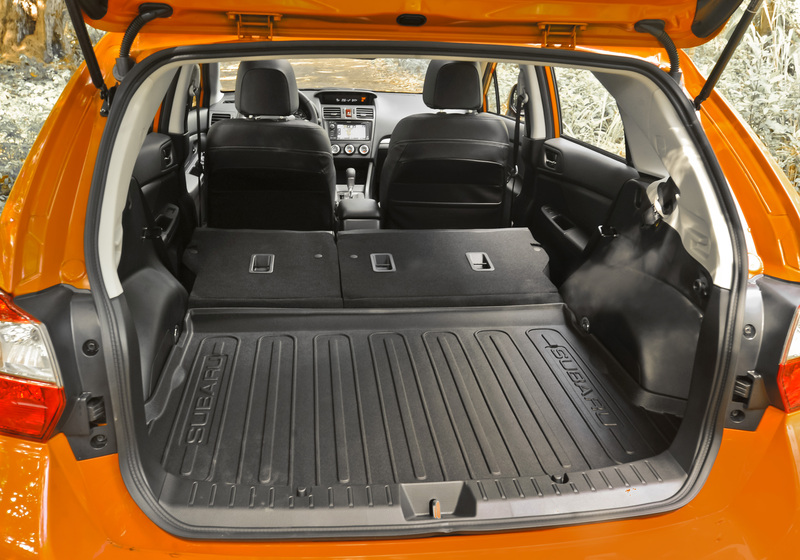 Secondly, the hatchback design makes it easy to load and very dog friendly with a low hop-in height. Thirdly, the gas mileage is excellent compared to similar vehicles. Finally, it is ideally suited to so many outdoor activities while still being a comfortable and frugal daily driver with an adorable, love me look.